The Cessna Citation M2 interior is a redesign of the Citation CJ1 light jet. The M2 is the new CJ1 and the cabin is one area Cessna focused on. The interior has been updated with a new design and materials. Inside the cabin, the Cessna Citation M2 can seat up 8 people including the pilot. Excluding the pilot the Citation M2 can seat up to 7 passengers, with one passenger siting in the copilot seat. The Citation M2 is single (one) pilot certified, allowing the copilot seat to be used as a passenger seat. In the Citation M2 main cabin, there are 4 individual club style seats with armrests. They are arranged 2 by 2 with a folding table located in between them. There is an optional "jumpseat" that can replace a cabinet that is located at the main entrance. 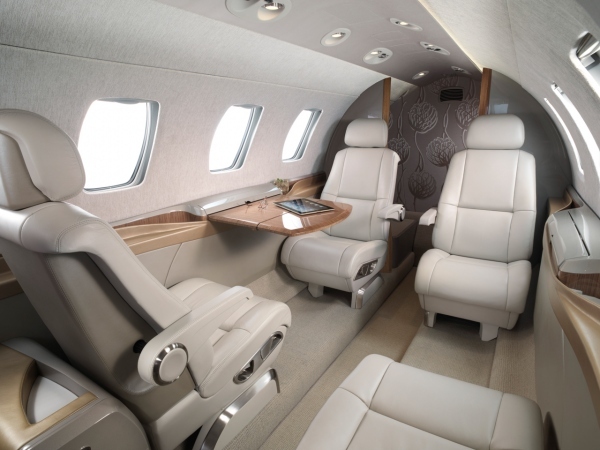 Without the jumpseat, the Cessna Citation M2 can only seat 6 passengers and 1 pilot. At the back of the jet airplane is the lavatory / toilet. It is a flushing toilet and there is no sink in the cabin. The lavatory seat can be used to seat a passenger and has a seat belt installed. In front of the seat is a coat area with a clothing rod. All of these seats allow the Cessna Citation M2 interior to seat up to 7 passengers. An option for the jet is Heads Up Technologies Clarity Wireless media server with Wi-Fi that provides media entertainment. The Cessna Citation M2 cabin also has optional in-flight internet service. Another feature inside the Cessna Citation M2 interior are the two 110 volt AC outlets that can provide 5 amps per outlet. The cabin has options for 6 different interior colors that include Carbon, Citrus, Frost, Mink, Pearl and Raffia. The interior featured below in the photo is the Pearl color option. Below are the dimensions of the interior of the light jet. Above Citation M2 cabin photo by Cessna. Used under the fair use provision. Below is a list of the features and components of the cabin. Some may also call the interior of this aircraft the Cessna 525 Interior - Cabin. This is due to the fact that the official model name of the aircraft is "525".